In the wake of yesterday's Budget, Tim Horton and Howard Reed present an updated distributional analysis of the effects of the coalition’s major direct and indirect tax changes. Following last year’s June 2010 budget we produced a distributional analysis of the impact of the above-inflation increase in the income tax personal allowance (from £6,475 to £7,475) and the 2.5 percent increase in VAT. Our analysis showed that the combined impact of these tax measures was regressive – hitting people with the poorest net incomes hardest (adjusted for household size). Both those measures come into force this year: the VAT rise occurred in January, while the allowance increase takes effect this April. In yesterday’s budget speech George Osborne announced a further increase in the income tax personal allowance – to £8,105 – from April 2012. Another (pre-announced) change is that this April, the thresholds for National Insurance Contributions (NICs) for employees and self-employed people will rise roughly in line with the increase in the personal allowance, but there is also an increase of 1 per cent in the contributions rates above this level. In this post we update our distributional analysis of the effect of tax changes under Mr Osborne to take account of the further increase in the income tax allowance and the employee and self-employed NICs changes. The analysis also uses updated income distribution data (from the 2008-09 tax year) and improved modelling techniques. The graph below shows the distributional impact of these tax changes by April 2012 compared with the April 2010 tax system that the coalition government started with, and correcting the April 2012 thresholds and allowances for inflation. • The blue, red and green bars show the distributional impact of the income tax cut, NICs changes and VAT rise respectively. • The impact of each change is shown as a percentage of household net income (rather than in cash terms). • The income tax cut gives the most money (as a proportion of net income) to households in the middle of the income distribution. Households at the bottom mostly have incomes below the initial (April 2010) allowance level of £6,475 and so do not gain from the allowance increase. • Because the increase in the allowance is worth a maximum of £326 per person in nominal terms, the impact for people on higher incomes is lower as a percentage of net income, but the higher number of two-earner households in the middle deciles means they gain more (on average) overall than the lowest deciles. • For higher rate taxpayers at the top of the income distribution the reduction in the personal allowance negates completely the impact of this year’s allowance increase (but not next year’s allowance increase). The national insurance changes also have a positive net impact for the bottom two-thirds of the income distribution, although the increase in the lower threshold is offset by the increase in NICs rates which means the positive effects are smaller, and for households in the top four deciles the NICs changes reduce income. (We do not include the impact of the change in employer NICs also taking place in April but again, this consists of an increase in the threshold combined with an increase in the contributions rate and so to the extent that the increase in employer NICs is passed through to employees in lower wages, the distributional effects will be similar to the employee NICs increase). The VAT increase is a regressive tax change (at least, when the impact on living standards of a VAT increase is measured as a percentage of net income) because poorer households consume more (relative to their income) than do richer households. The size of the VAT increase (£11.5 billion by 2012-13) also outweighs the income tax cut (£4.7bn by 2012-13) while overall the NICs changes also increase revenue, and so the overall impact of the tax changes is to reduce household incomes. Overall the distributional impact of the tax changes is an “inverted U shape” – with the poorest households and the richest households losing more than households in the middle. The government’s own analysis of distributional effects of the tax changes (Figure A.3 in its Budget document [pdf]) suggests that the changes are much more progressive than this at the top end of the distribution but that is because Table A.3 includes the tax increases above £100,000 (withdrawal of the personal allowance and the introduction of the 50p income tax rate) announced by Labour in 2009 which came into force in April 2010, before the Coalition took office. 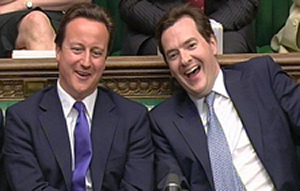 Here we confine ourselves to direct and indirect tax changes taking effect in 2011 and 2012. Our analysis also does not include changes to benefits and tax credits which (as the Institute for Fiscal Studies showed in its post-spending review presentation last October, are regressive overall. So, overall, the tax changes introduced this year and next will increase the squeeze on Britain’s poorest families. Finally, it’s worth remembering that the swingeing cuts announced in the spending review will have the biggest negative impact on the living standards of the poorest families – as shown in previous analysis we conducted back in the Autumn. The Budget made no attempt to lessen these service cuts. RT @leftfootfwd @TimJHorton & @HowardRReed http://bit.ly/efScDA Budget 2011 distritbutional analysis>"squeezed middle" benefiting most? One more ONS quote: “referring to income distribution to identify the incidence of indirect taxes on households with low income can be misleading”. Sadly that’s exactly what this article has done. Not much support here for the “squeezed middle” narrative, then – though I suspect the picture would look very different if you took into account cuts to tax credits and the removal of child benefit from top rate taxpayers. I’d be very curious to see the numbers crunched on this. An important point – but worth remembering: VAT increased from 17.5% to 20% – this is not a 2.5% increase as incorrectly stated but is approximately a 15% increase. Be very careful.The policies of the last Labour government in general, and of Gordon Brown in particular, did more to widen the income gap than any post war government.Abolition of 10p tax band ring a bell?Low earners are least likely to vote,as the economic genius knew full well.If you inflate the public sector to an unsustainable level,the resultant remedies(more tax, less public spending)are bound to inflict the bottom of the pile, more.The man is a coward, he does not even appear in the House to represent his constituents. Duncan – many thanks for your comment. I agree that the distributional impact of VAT looks different if you use decile measures based on expenditure. However, I think there are other issues with using expenditure deciles which ONS hasn’t really considered – for example, it’s quite possible that people at the bottom could be spending more than their net incomes over substantial periods of time by borrowing – often from doorstep lenders at extortionate rates of interest (as Compass has pointed out in its “end legal loan sharking campaign”, for example.) Snapshot income is not a very good measure of long-term living standards for many households at the bottom – but expenditure probably isn’t, either. In our June 2010 analysis we looked at an alternative where we allocated VAT payments proportional to income (i.e. flat across the distribution) – and it didn’t change the overall shape of the results that much. The same would be true this time but we didn’t put the extra line on here because the graph was already cluttered. Absolute and demonstrable rubbish. It was under Thatcher that inequality skyrocketed; it dipped and then rose again slightly under Labour. See graph at the bottom of this page. Don’t get me wrong: I think New Labour didn’t take inequality seriously enough. They should have done more, and they were wrong to think the income gap doesn’t matter so long as you tackle poverty. But it’s ludicrous to suggest they were worse than Thatcher. For the record,Ed Miliband has just admitted on the BBC 6 o’clock news that under Labour income inequality worsened.That IS 13 YEARS. Well of course he’s admitted that. One of the reasons I voted for him was that he was openly critical of New Labour’s record on and attitude to inequality. It’s still not remotely true, though, that their policies actually *promoted* a very large rise in inequality in the way Thatcher’s did. (This was a woman who genuinely believed income inequality was a good thing: “Let our children grow tall, and let some grow taller than others”). It’s just that they *failed to prevent* a small rise in inequality (in spite of their success in redistributing wealth from the rich to the poor).